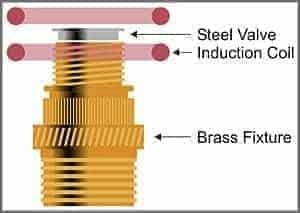 To braze a stainless steel valve seat to a brass plumbing fixture in an oxygen atmosphere and improve assembly reliability. The testing was done in an open air atmosphere. A specially-designed, two turn helical inductor was used to provide optimal heating to the joint area of the plumbing assembly. Initial tests were conducted with bare parts and temperature sensing paints to establish time-to-temperature and heating profiles. Next the parts were placed in position with a joint clearance of .002” to .003”. The braze ring preform was positioned and black flux was applied to the assembly. RF heat was applied with the RF power supply for 7 seconds to reach the brazing temperature of 1325°F. 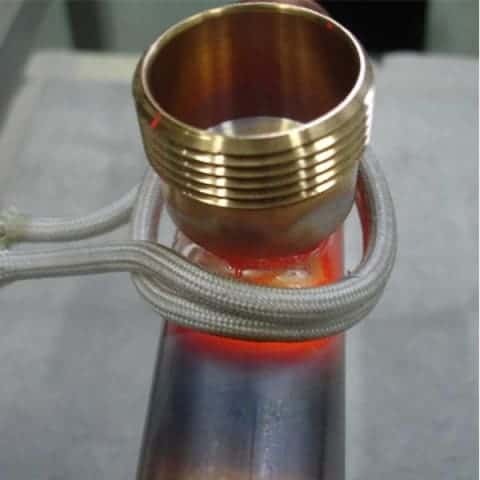 At this temperature the braze alloy flowed into the joint and formed a strong bond. Consistent, repeatable results were achieved at 1325°F within 7 seconds. The braze flowed well. 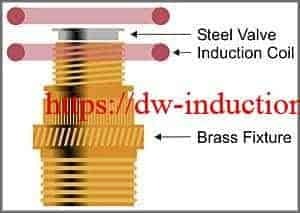 Induction brazing produces a strong, clean joint which is ideal for this type of consumer product.